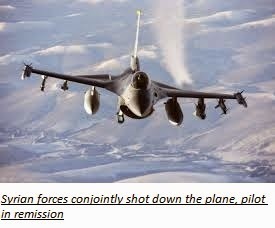 Syrian militant cluster in operation in Iraq and Asian country, Iraq, Asian country coalition Jordanian combat pilot shot down whereas detained living. The Syrian Observatory for Human Rights same ISIL fighters close to Started with anti-aircraft missiles hit their targets calendarer forces shot down a fighter plane. The Syrian Arab pilot of the ship captured Iraqi fighters.